As I noted in my last post, I attended the program “Next Steps: Moving Forward with Grace” sponsored by the Episcopal Church’s Diocese of Pittsburgh last night. I had planned to write a report about the event, but I discovered that Dr. Jeremy Bonner, an historian who recently finished a history of the Episcopal Diocese of Pittsburgh, has already written a fair accounting of last night’s event on his blog, Catholic and Reformed. You can read Dr. Bonner’s post here. I can, however, add a few details. There were, according to one count, about 140 people present, and the diocese seems to have been successful at attracting people from divided parishes. The meeting seemed to accomplish what it set out to do, namely, inform people who want to stay in The Episcopal Church about what is going on in their diocese and give them direction as to what they might need to do. The event ran smoothly, though participants not from the cathedral seemed to have trouble using the cathedral microphones. (The church is acoustically difficult.) Light refreshments were provided, and no one objected to people’s taking coffee and cookies into the pews. There were several handouts: an agenda, the current list of remaining parishes, a list of contacts, and a printed version of the evolving “Frequently Asked Questions for Parishes” from the diocese’s Web site. The agenda, curiously, listed the program’s title as “Next Steps: Moving Forward in Grace,” not “with Grace,” as it was billed on the Web. There may be a theological issue here, but the inconsistency is more likely due to a failure to communicate. A letter was read from the bishops of the other Pennsylvania dioceses (Bethlehem, Central Pennsylvania, Northwest Pennsylvania, and Pennsylvania) offering their support to Pittsburgh. That letter can be read here. I should note two minor corrections to Dr. Bonner’s account, which I have already commented upon on his blog. The event was not an Across the Aisle event, but an Episcopal Diocese of Pittsburgh event. Across the Aisle, which has always had a tenuous existence as a formal organization, will, I suspect, quickly fade away. Many of the most prominent players in Across the Aisle have assumed formal roles in the reorganizing diocese or are otherwise helping with the reorganization. Whether some remnant or echo of Across the Aisle will live on as a mechanism to facilitate communication within the diocese is unclear and, as far as I know, has not seriously been discussed. Like Dr. Bonner, I was uncertain of the canon cited by the Rev. Jim Simons to justify the Presiding Bishop’s recognition of the present Standing Committee. Bonner wrote down “124”; I wrote down “I.2.4,” but I doubt that I was very much more certain than he was. I checked the canons today, however, and discovered that the proper reference is to Canon I.2.4(a). I attended the “Next Steps: Moving Forward with Grace” event sponsored by the Episcopal Church’s Diocese of Pittsburgh last night. It was held at the downtown Trinity Cathedral, and I planned to ride the “T,” the light rail system of Port Authority of Allegheny County. I can board a train three blocks from my house and get off a block from the cathedral. I don’t make the light-rail trip downtown often, but I keep tickets around, so that, when I do use the “T,” I don’t have to worry about exact change. The tickets can be bought in books of 10, and, a few years ago, the tickets were sold at a small discount. This is no longer true, but the tickets still allow riders to avoid a rush-hour surcharge that must be paid by those using cash. To avoid any surprises upon boarding, I called the customer service number on the ticket to find out how much I would have to pay. After a lengthy wait on hold, I was told that the fare change had been made in January, and riders had been given three months to use their tickets, which, in October, were no longer accepted. This was a very unpleasant and unexpected surprise. The tickets say, after all, “this ticket may be used for one ride through one zone,” and “subject to fare changes” does not suggest, at least to me, that the ticket could become worthless. Before I got a chance to confirm that a transfer still costs 50 cents, I accused Port Authority of being a bunch of thieves, whereupon the customer service agent hung up on me. The customer, I suppose, is no longer always right and doesn’t even have to be listened to. Having just been relieved of $12.50 by my local transit agency, I don’t think I’ll buy any more tickets. 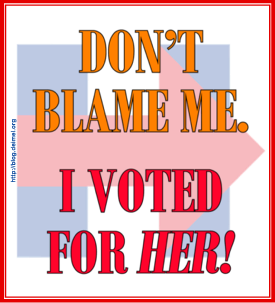 At least when I buy a stamp, I know it will always be worth at least what I paid for it. 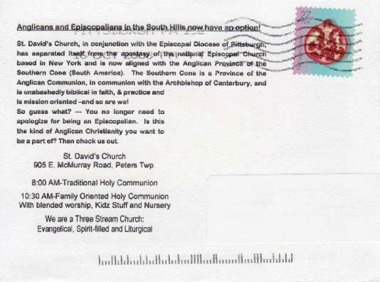 Not surprisingly, the disposition of parish property of dissident Episcopal congregations repeatedly surfaces as a topic of conversation on The Houses of Bishops and Deputies e-mail list. It is a critical issue, since The Episcopal Church has no power to keep its members from leaving. If congregations want to depart, whether to join a different church or even to found a new church, there is nothing that can stop them, except, of course, if they want to take parish property with them. I reluctantly, and with sadness, find I must reply to an argument being offered concerning the property of the Diocese of Pittsburgh. The claim has been made that the property belongs to those who are currently tending it. One of the clearest of principles in The Episcopal Church (and many others) is that we are stewards, not owners. It is a scriptural concept, that we are the temporary managers whose job description is to maintain and enhance (see Parable of the Talents, Mt. 25:14–30) that with which we have been entrusted and then pass it on to our successor. It has worked brilliantly for centuries. Clergy are entrusted with Church buildings, land, chalices, vestments, linens, and other appointments of worship and community. Our generous forebears have left behind dedicated funds for music, for scholarships, for endowments, for personnel positions, and for maintenance of all the above. Unfortunately, from time to time, some group makes the judgment that “this time is special” and that “we are more able, more effective, more holy, more scriptural, more just, or more righteous than others. Therefore, we must take ownership of that we once accepted in trust as stewards.” But I would think that such a self-praising judgment needs to be left to the One true Judge, who will separate the sheep from the goats and the wheat from the chaff. I question neither the sincerity nor the commitment of such folk. I understand that I am a dinosaur who actually believes that vows should be taken seriously. At my Ordinations to Diaconate and Priesthood, not only did I respond orally and positively to accept the doctrine, discipline, and worship of The Episcopal Church, but I also signed the documents of that vow before the ceremony could be continued. I believe in the Communion of Saints. For me that includes the hundreds and the thousands of wonderful lay people who gave so much of their time, talent, and treasure to build these communities and then passed them on to another generation. In both our sacred and secular worlds, there are too few voices of gratitude for those who have given us so much and too many shouts of “mine” in this difficult moment of God’s history. Serving as a steward was a great honor and privilege for me and I never felt the need or desire to be an owner of such a treasured place and gloried history. But then, I am a dinosaur who believes in vows and commitments, and dinosaurs are best known for being extinct. This past week, my parish church, St. Paul’s, Mt. Lebanon, received a letter from Robert G. Devlin, “chancellor” of the “Episcopal Diocese of Pittsburgh.” It included, as an enclosure, a copy of the stipulation agreed to by all parties in the Calvary lawsuit and signed in October 2005. 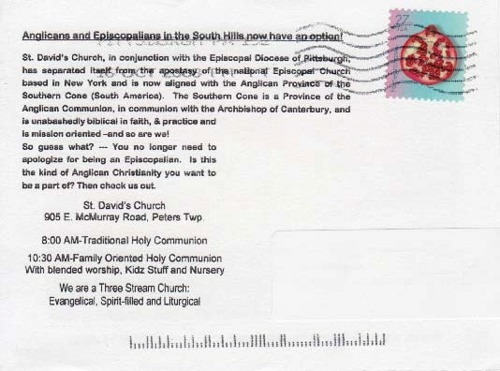 According to the Pittsburgh Post-Gazette, the letter was sent to each of the churches that have declared that they are remaining in The Episcopal Church. It is our prayer that you do not wish to separate yourselves from the Diocese, but whatever your position, we wanted to make you aware of the Stipulation and Order signed by President Judge Joseph M. James of the Court of Common Pleas of Allegheny County. Specifically, the Stipulation and Order directs certain steps that a Parish Church shall take if it elects to disaffiliate with the Diocese. Indeed it is. The Episcopal Diocese of Pittsburgh and, I hope, most “normal” people have one view of reality. 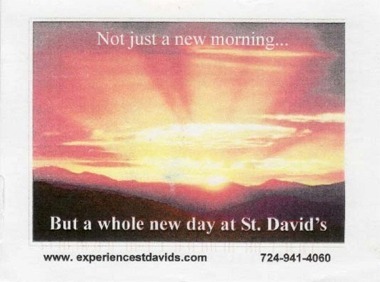 What the Post-Gazette calls the “Episcopal Diocese of Pittsburgh (Anglican)” has quite another. 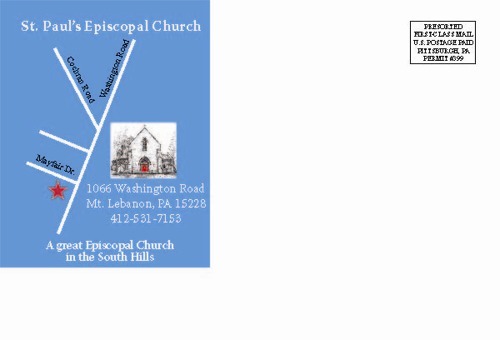 I should also note that, as much as I appreciate the Post-Gazette’s attempt to distinguish between the “Episcopal Diocese of Pittsburgh” and the “Episcopal Diocese of Pittsburgh (Anglican),” not only is the latter not a diocese, but the Episcopal Church diocese has more right to be called “Anglican,” both institutionally and theologically. Let me return to the stipulation, about which Mr. Devlin was reminding his correspondents. Calvary Church sued Bishop Duncan and other diocesan leaders on behalf of the Episcopal Church diocese, in an attempt to keep diocesan leaders from improperly transferring property out of the control of The Episcopal Church. Defendants in the lawsuit managed eventually to have the diocese added as a defendant, a move that had the primary effect of allowing their legal costs to be paid by the diocese (and, therefore, in part by the potential victims of their depredations). Property,.whether real or personal (hereinafter "Property"), held or administered by the Episcopal Diocese of Pittsburgh of the Episcopal Church of the United States of America (hereinafter "Diocese") for the beneficial use of the parishes and institutions of the Diocese, shall continue to be so held or administered by the Diocese regardless of whether some or even a majority of the parishes in the Diocese might decide not to remain in the Episcopal Church of the United States of America. For purposes of this paragraph, Property as to which title is legitimately held in the name of a parish of the Diocese shall not be deemed Property held or administered by the Diocese. In the event a parish in the Diocese (hereinafter “Parish Church”) shall elect to disaffiliate with the Diocese, the Parish Church shall give written notice of that election to the Diocese by delivering a copy of the notice, signed by the Rector and the Vestry, to the Diocesan Bishop (hereinafter “Bishop”), to the Board of Trustees of the Diocese (hereinafter “Board of Trustees”), to each member of that Parish Church and to the Rector and Vestry of each other Parish Church of the Diocese. Upon receipt of such notice, the Bishop and the Board of Trustees shall meet with representatives of that Parish Church and any other parties expressing an interest to discuss in good faith the disposition of all Property specifically held for or in the name of the Parish Church. The stipulation goes on to specify a complex negotiating process whereby disposition of the parish property is to be determined. This, of course, is the process in which Devlin suggests parishes wishing to remain in The Episcopal Church need to engage. Devlin—why does this sound like a name from an allegory?—assumes that “Diocese” means the entity of the realigners. According to the Post-Gazette story, Devlin “said the language in the stipulation refers to the diocese that signed it in 2005, meaning the diocese that voted to join the Southern Cone.” The first part is certainly true; there was only one diocese to talk about in 2005. In fact, the diocese that voted, albeit invalidly, to join the Southern Cone was still the diocese of The Episcopal Church. Devlin then went on to say, “The entity that adopted the resolutions [to realign] on Saturday is the Episcopal Diocese of Pittsburgh.” He seems to put a good deal of stock in the fact that Bishop Duncan registered a Pennsylvania nonprofit corporation called “Episcopal Diocese of Pittsburgh” this past spring. (The Episcopal diocese has always been an unincorporated association.) The rub, of course, is that the stipulation states that diocesan property stays with “the Episcopal Diocese of Pittsburgh of the Episcopal Church of the United States of America [emphasis added].” How can this be whatever entity Mr. Devlin thinks he is representing if its members claim not to be in The Episcopal Church? The October 4 story from ENS quoted some of Bishop Duncan’s remarks at a news conference after the convention. He described the way the convention had done its work as “graceful and charitable.” “[W]e wanted to show ourselves to be Christian people who followed Jesus in a way that speaks of his charity, his grace and his love,” he said. The rest of Devlin’s letter, however, belies any protestations of Christian grace and charity. He emphasized that “the Diocese”—whatever it is that Devlin thinks he represents—“is committed to following” the stipulation’s process for negotiating parish property. As we have seen, however, “the Diocese” must be the Episcopal Church diocese, so the negotiation should be between the diocese whose Standing Committee is headed by Simons and the parishes trying to leave The Episcopal Church, thereby turning Devlin’s view of what must happen on its head. Lewis Carroll was never so imaginative. Parishes are being advised to ignore Devlin’s letter. A friend of mine has systematically been reading my poetry on Lionel Deimel’s Farrago. Her comments on one poem inspired my rereading a few of my older poems myself. I was particularly struck by “Christian Unity.” I’ve always liked this poem, but I had forgotten exactly when I wrote it. “Christian Unity” was written at the end of the summer of 2002, just after Resolution #1, the so-called South Carolina Resolution, had been introduced for consideration at Pittsburgh’s November diocesan convention. The resolution was a kind of conservative shot across the bow of General Convention 2003, and its introduction was the event that led eventually to the founding of Progressive Episcopalians of Pittsburgh. We affirm that in God’s love for all people, the only sexually intimate relationships receiving His blessing in Scripture and Tradition are those of a man and a woman within an intended life-long, faithful, marital covenant. The Church cannot bless any other sexual relationship, and we cannot recognize the blessing of any other. When I wrote the poem, I had no idea that such bitter times were ahead for the Episcopal Diocese of Pittsburgh. The poem is irenic and perhaps even evangelical. At least as far as the Pittsburgh diocese is concerned, however, it may have been naïve. Ironically, both the initial and final versions of the resolution expressed a commitment to The Episcopal Church. Many of the people who voted for this resolution also voted last weekend to leave The Episcopal Church. My poem is reproduced below. Who answer to his loving call. For Christians near and Christians far. The kingdom will be ours some day. That turn our Christian friend to foe. To those who don’t the Savior know. I returned home from the convention of the Episcopal Diocese of Pittsburgh a couple of hours ago. 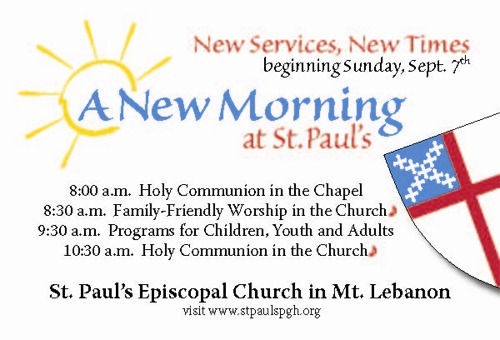 I have been busy updating the Progressive Episcopalians of Pittsburgh Web site and sending out a PEP press release. As readers are likely to know by now, the diocese voted today to “realign” to the Southern Cone from The Episcopal Church. This process involves several canonical impossibilities, not to mention theft—there is no other proper word for it—of Episcopal Church property. I have written about the impropriety of “realignment,” however, and I don’t much want to revisit the subject now. Many things happened today that deserve comment, but I want to restrict myself to only one at this time. I may write about other matters later. The diocese is now in the Southern Cone “temporarily while a new Anglican Province for North America is being organized." These people have big dreams. The diocese is no longer a part of “‘The Episcopal Church’” (quotes in the original). The Episcopal Church cannot remove clergy and lay leaders from their positions. They don’t have to. The leaders have removed themselves from The Episcopal Church. What, exactly, are “cases like ours”? Only San Joaquin has tried to do what Pittsburgh has done, and that litigation won’t go to trial for nearly a year. Parishes need do nothing now; they have two years to adjust their bylaws. Parishes realigning risk being sued by The Episcopal Church and, likely, the reorganized diocese. Paying assessments to those currently in control of diocesan assets can certainly be taken as an indication that the parish intends to abscond with its property. “In any case, we will make a strong case that we are the true Episcopal Diocese of Pittsburgh. I can make a strong case that I am Napoleon, but that doesn’t make it true. All in all, this was something of a depressing day. Pittsburgh Episcopalians have much work and, alas, litigation ahead of them. The good news is that each side—they were called “realigners” and “reorganizers” today, rather than, say, “saints” and “apostates”—will, at some future time, feel unencumbered by the other. I cannot say what will become of Robert Duncan’s dreams of glory. If they are realized, however, the Anglican Communion will, in essence, be destroyed. It is a recognized phenomenon that people who have been abused (or think they have been abused) often visit abuse on others when they have the power to do so. Abused children often grow up to become abusive parents, for example. I was reminded of this two nights ago while attending a pre-convention briefing held by the Episcopal Diocese of Pittsburgh. The self-styled “orthodox” are tireless in telling us that they are persecuted in The Episcopal Church. (They are much less diligent in explaining how they are persecuted, other than the fact that, since they are a pitifully small, though vocal, minority, they are not allowed to control the church, which they passionately want to do.) In large measure, our former bishop, Robert Duncan, has promoted “realignment” to escape the oppressive hand of the “evil” Episcopal Church, so that he and his “orthodox” colleagues can can govern a new church in a more godly manner. It is too seldom reported how autocratic, manipulative, and just plain petty, “orthodox” rule can be, however. Bishop Duncan is certainly an offender, though not nearly so outrageous an offender as, for example, Bishops Schofield or Iker. Via Media USA attempted to document the indignities attendant rule by “orthodox” bishops in its 2005 report “In Our Many Voices,” but that report only scratches the surface. On Monday, though, it was the pettiness we have seen in the Diocese of Pittsburgh that angered and saddened me. For years, Bishop Duncan has held diocesan events only at churches that have enthusiastically supported him and his schismatic objectives. 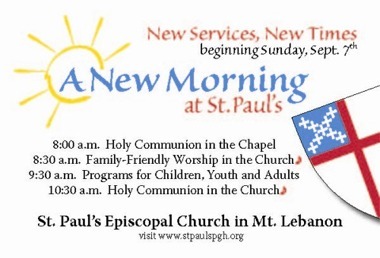 It is a mild annoyance when such events are held at Ascension or St. Stephen’s, Sewickley, site of Monday’s gathering. These parishes have large facilities that can accommodate the hundreds of people who attend, say, a diocesan convention. True, a Calvary or a St. Paul’s, Mt. Lebanon, could also host such a meeting comfortably, but one cannot really complain about the facilities offered by a St. Stephen’s. Unfortunately, Saturday’s historic convention at which the diocese will vote on “realignment” is being held at St. Martin’s, Monroeville. St. Martin’s is probably best described as a medium-sized church of the diocese and one that has been unflagging in its support of Bishop Duncan. Because the diocese held a special convention there in 2003, however, I know how inadequate the church is for such a large event. This week’s convention will surely be a larger one, and holding it at St. Martin’s is perverse. A good deal of time at Monday’s briefing was given over to explaining how deputies and visitors will be inconvenienced by the decision to use St. Martin’s. To begin with, since the worship space, where the convention will be held, is so small, only actual deputies and the press will be allowed in. Observers will be packed into the rather small parish hall. At the 2003 convention, observers had to listen to a low-fidelity audio feed. In 2008, we have been promised a video feed, though a similar arrangement at last year’s convention in Johnstown, held at the more commodious yet inadequate St. Mark’s, included virtually unintelligible audio. At the briefing, it was explained that deputies have been given parking passes, though they were encouraged to carpool. Visitors, who cannot be accommodated in the small parking lot of St. Martin’s, are to park at a Lutheran church some distance away and to ride a shuttle being provided by the diocese. The diocese is selling box lunches to deputies—there is no food service within walking distance—but visitors cannot guarantee the availability of food other than by bringing their own. St. Martin’s is just off the Parkway East. The Pennsylvania Department of Transportation has been rehabilitating this road recently and has been closing it partially on weekends. It is unclear whether the road will be closed this weekend, but, if it is, it will delay the arrival of many attendees, as it is the primary route to the church from Pittsburgh. This is a special problem, since registration for deputies closes promptly at 8:25 AM. All of these problems attendant to conducting a convention at a “friendly” but inconvenient church have become routine in Pittsburgh. I lost it, however, when I was told that porta-potties had been ordered for the convention to serve the needs of the anticipated crowd. True Episcopalians are willing to endure bad theology. I don’t understand why bad theology has to be accompanied by bad planning and bad toilets, however. Of course, maybe this is just to punish the Episcopalian “pagans” like me. The “orthodox” attendees can feel like they are suffering for the sake of the true gospel.